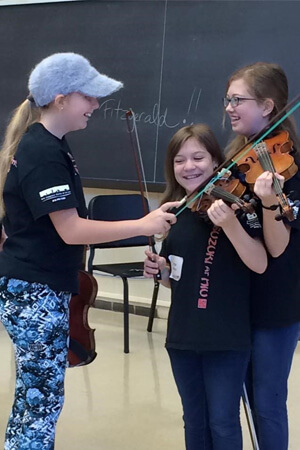 At the annual NIU Suzuki Workshop on Saturday, Nov. 5, guest Suzuki teachers from Ohio, Illinois, Connecticut and Maryland will visit and work with NIU Suzuki strings students, as well as students from Suzuki programs throughout Northern Illinois. Classes such as “Music Mind Games,” and group classes for guitar and violin will take place throughout the day. A Saturday workshop session for Suzuki parents features guest teacher and author Michele Horner, who will discuss her new book LifeLens: Seeing Your Children in Color, offering advice for understanding and respecting each child’s learning style. The Saturday workshop also includes a clinician recital at 11 a.m. in the NIU Music Building Recital Hall. This performance is free and open to the public. Violinist and current concertmaster of the Chicago Sinfonietta Paul Zafer will perform with cellist and Kishwaukee Symphony Orchestra Music Director Linc Smelser, and other guest teachers and NIU Suzuki faculty members. On Friday, Nov. 4, from 9 a.m. to 3 p.m., guest Suzuki teacher Elizabeth Cuhna leads a Music Mind Games Workshop for music teachers. Advanced registration for this workshop is required and space is limited. For information about these workshops and other NIU Community School events, please visit csa.niu.edu or call 815-753-1450.